The Capricorn full moon is fast approaching, and before I go any further into the details of the Cancer Sun/Capricorn Moon energies, take a moment to look carefully at the images on the left. What similarities can you see? 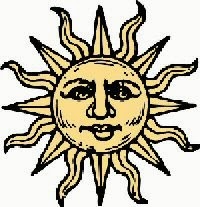 The Cancer (Chariot) sun energies are urging us to get out of our comfort zone and stay focused and determined to reach our goal. We realise that we need to take responsibility and keep steady in difficult situations. As long as we have self-assurance that our efforts will be rewarded, we can keep going. Combined with the moon energies of Capricorn (Devil), we need to take a break from our journey towards our desired destination. Now is a good time to enjoy our achievements already made along the way. But let's not get too complacent! The Devil is a card of illumination; depicting arch angel Uriel in the guise of Baphomet, the torch in his left hand is highlighting where we are right now - are we in a good place or a bad one? We are facing the facts as they are, which will help us revise our plans and generate new ideas if necessary. At the time of the full moon this month, the Capricorn energies of the Devil intensify our need to be realistic, ambitious, disciplined and resourceful; these are qualities that will help to make the right choices if major decisions have to be made that will affect the rest of your life. detaching from material possessions to be free to explore new opportunities; a great time to de-clutter your home! Cancer/Capricorn's water/earth combination is positive and suggests beneficial resolutions and outcomes during the full moon period; a great time perhaps to mix determination (Chariot) with earth magic (Devil). How are you making use of the Cancer/Capricorn energies this week? 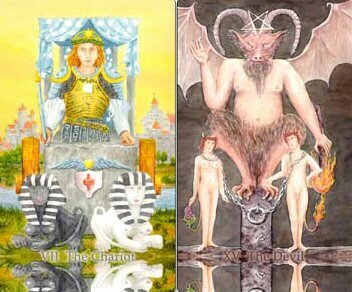 What additional insights does the Chariot/Devil combination on the image above offer you? Great insights here, Christiane - thanks for sharing! To me, as a Capricorn Sun Sign, The Devil is all about transcending self-imposed limitations and I associate the Cancerian Chariot with the solar plexus chakra (absolutely avoid aggression!). When I saw those cards together, my mind went straight to the children's game of Red Light, Green Light. I'm always up for studying more astrology. I love the layers it offers for working with Tarot. Thanks for sharing this. That's an interesting game, Arwen, I'm not familiar with, but it sounds great fun! ;) Yes, Astrology in Tarot is awesome... My new Tarot Astrology e-course will be available end of August!